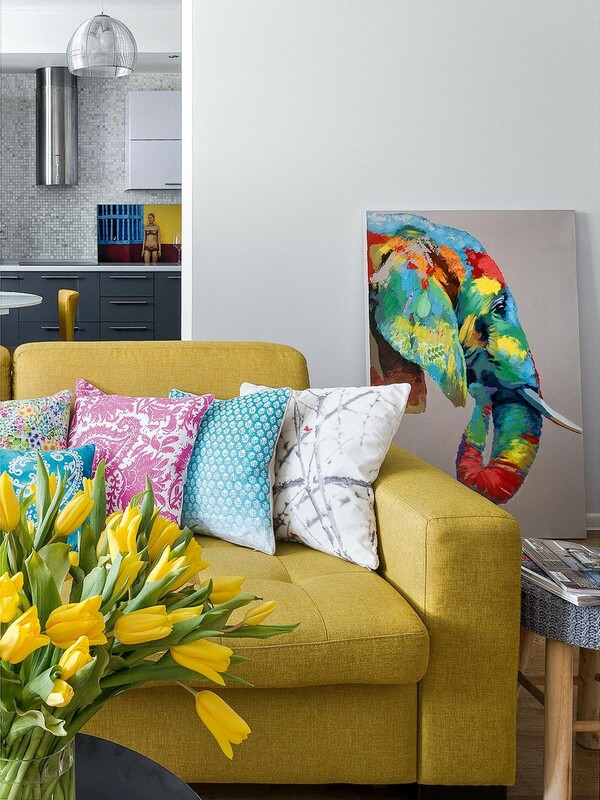 In the light and harmonious atmosphere of this apartment designed for a young family couple household conveniences and laconic contemporary design diluted with elements of Scandinavian style and pop art are as naturally combined as two dominating colors – pale gray and yellow. 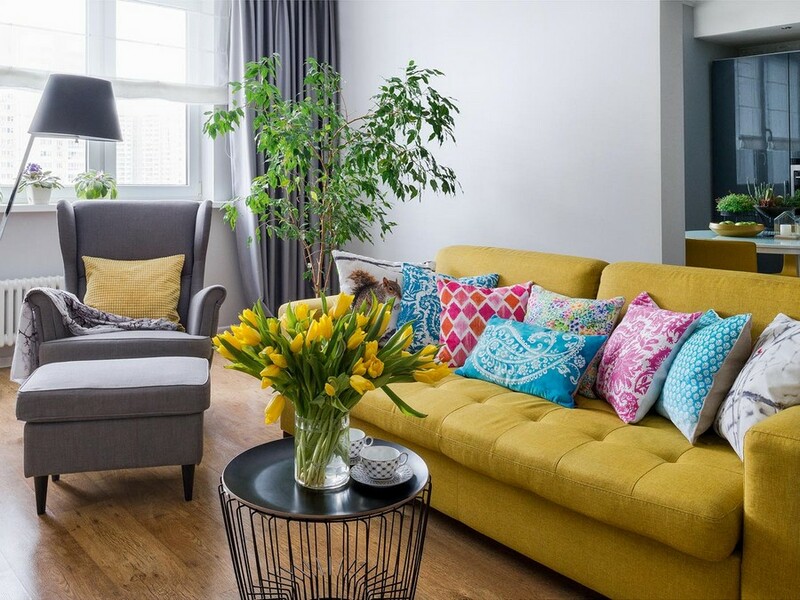 The spouses initially formulated the image of their future home as “contemporary interior, in which functionality is coupled with open and light space, and decor features bright color accents”. A professional decorator translated all these wishes into a real home, and we’re inviting you to have a look at it! The centerpiece of the lounge zone is a comfy upholstered sofa coupled with an arm-chair with ears and a footrest. They create the atmosphere of hominess and comfort. 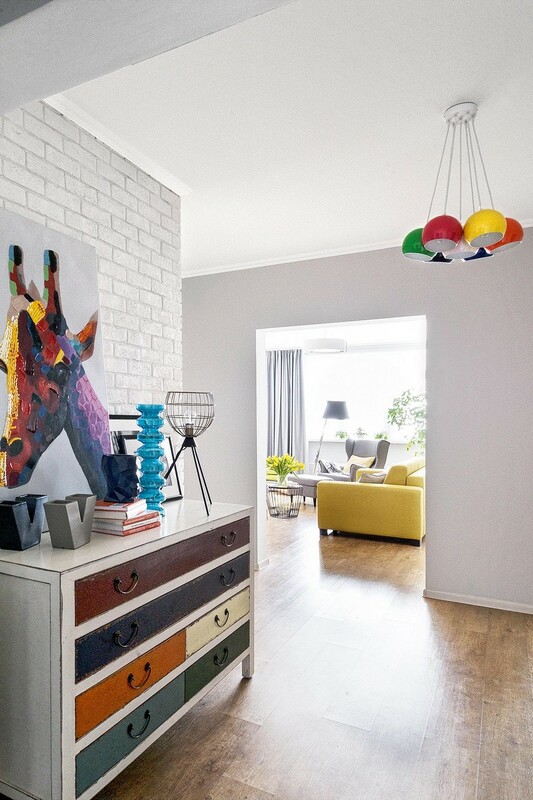 Despite the fact that a few splashes of bright colors can be found in this room, they’re very competently dosed and do not overload the space – just a little bit refresh the neutral background: white painted ceiling, light “oak” laminate floor and pale gray walls. All electric kitchen appliances are built in a tall cabinet by the window. 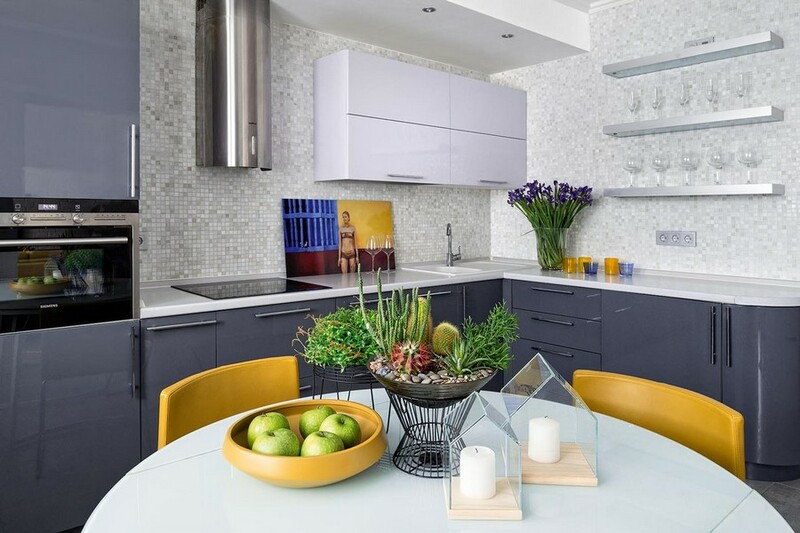 Glossy cabinets soften its bulky volume, and some airiness is added by the glimmer of mosaic tiles on the backsplash. 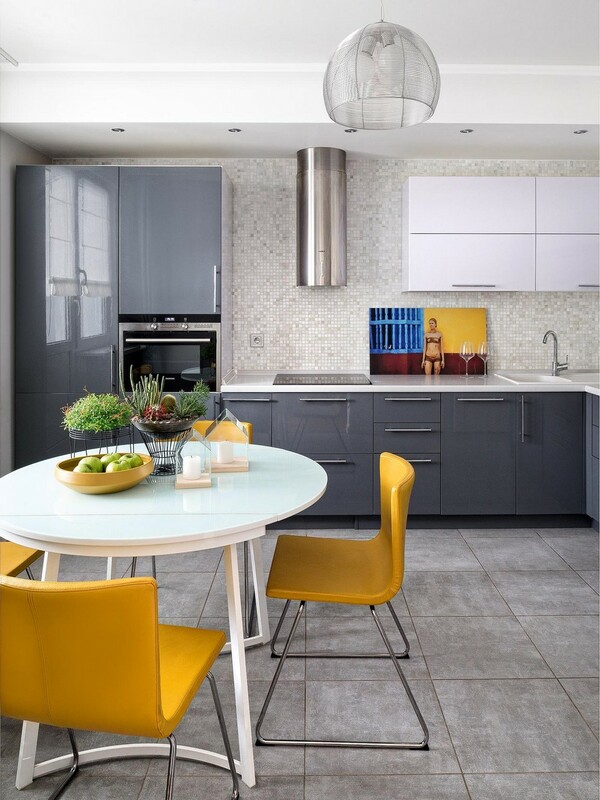 To preserve the sense of lightness, the author would abandon conventional top cabinets in favor of a few open racks and a single compact top module above the sink, which was painted unlike the rest of the kitchen set to make it appear almost invisible against the background of pale mosaics. A washing machine was built into one of the base cabinets for the sake of more spaciousness in the bathroom. There are no doors between the hallway and corridor, the corridor and living room, and living room and kitchen. And the airy communicating space was decorated with a roomy multicolor chest of drawers coupled with the same-style cheerful lamp. One of the walls in the living room and two walls in the corridor are faced with faux brick tiles and painted pure white. Splashes of colors in airy, non-cluttered interiors remind of April colors, when the first warm rays of sun are changing the gray landscape. Minimum of furniture and the background of smoky, silvery and white hues make the rooms lighter, and to crown it all create a perfect background for any color accents, such as home textile and artworks, which look especially fresh and expressive in such environments. Turquoise shades in wallpaper and curtains bring the sense of coolness to the bedroom mood. 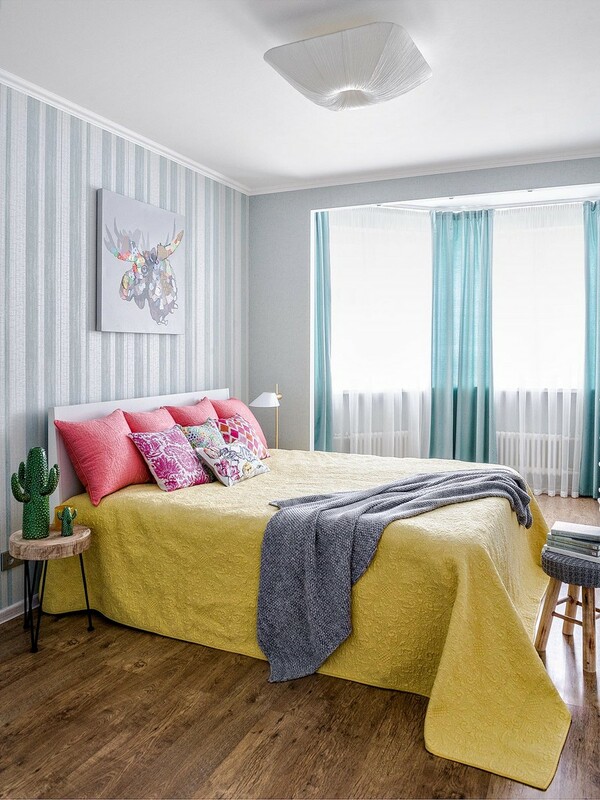 And vertical stripes on the wallpaper make the walls appear visually higher and the room bigger in general. 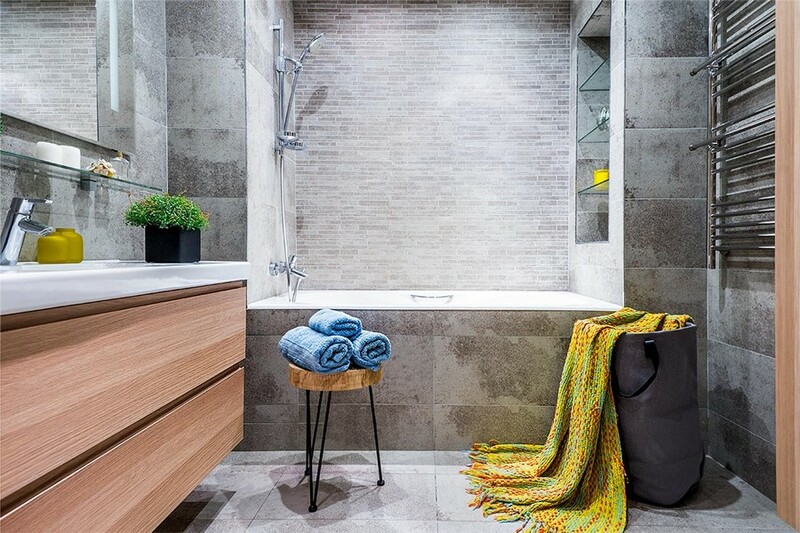 Gray ceramic granite with quite rough and brutal texture (we already saw it on the kitchen floor) surprisingly adds lightness and coziness to the bathroom interior: with it a recessed bathtub looks like a font in a grotto. And on the whole, all the zones are very harmoniously united, just like in the living nature.